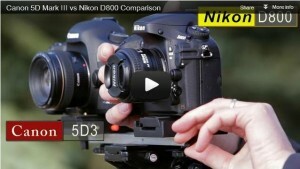 One of best comparison video about Nikon D800 and Canon EOS 5D Mark III. Both have pluses and minuses, both are full frame DSLRs, have dual card slots SD and CF, 100 view finder coverage, weather sealed body, both have a somewhat similar Continuous Shoot Speed, both have excellent auto focus systems, and both now have new headphone jacks. Next Next post: Nikon D600 and Sony A99 will share same 24 MP sensor ?